"Go Tell It at the Quilt Show!" is a Quilt Alliance project designed to capture the stories of quilts where quiltmakers gather. One quilt, one person, one video camera, three minutes = another quilt story saved! Back in October, 2018 quite a few of our members participated in the Quilt Alliance’ program to record quilters stories about their quilts. These videos, 22 in all, are now available on YouTube and can be found on our Videos page. Please check them out at your convenience! How exciting! Just to show that what we do makes a difference, here is a heartwarming Pillow Pal success story. This story was sent to us by a happy recipient and is posted with their permission. Our biennial quilt show, Broward Quilt Expo (BQE), will be held Monday, March 4th through Sunday, March 10th, 2019, again at the historic Holiday Park in Fort Lauderdale, FL. As the Quilt Entry Chair, I would like to invite members of your guild to participate by entering a quilt (or two!) in our show (judging to be held in February). The award-winning quilts receive not only a beautiful ribbon for your quilt, as well as one for you to wear, but also a cash prize. Please visit our website, browardquiltexpo.com and click “participate” choosing “quilt entry” for more information. Our 2017 show included over 200 quilts and we’re looking forward to even more quilts in 2019. Our vendor booths are going to be full, and we’ll have demonstrations and activities throughout Saturday and Sunday. We hope that you’ll not only enter a quilt, but will also bring your friends to see the show and to shop at our vendor booths. We’ll be offering some great value GROUP-VIP packages this year --- our Admissions chair will be in touch very soon with the details. We’re hosting workshops Monday through Thursday before the show with teachers Jean Wells and Tara Faughnan. These are also open to your members. If you have any questions please don’t hesitate to contact me at judywkap@gmail.com, or (954) 753-5493. 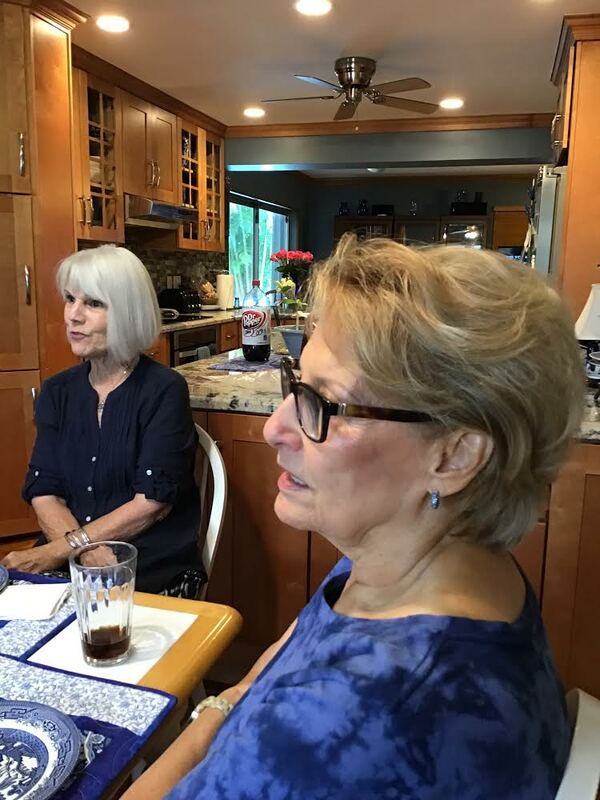 In an effort to make new members feel more comfortable and allow us to get to know them better, the idea was proposed to have a "new member luncheon". 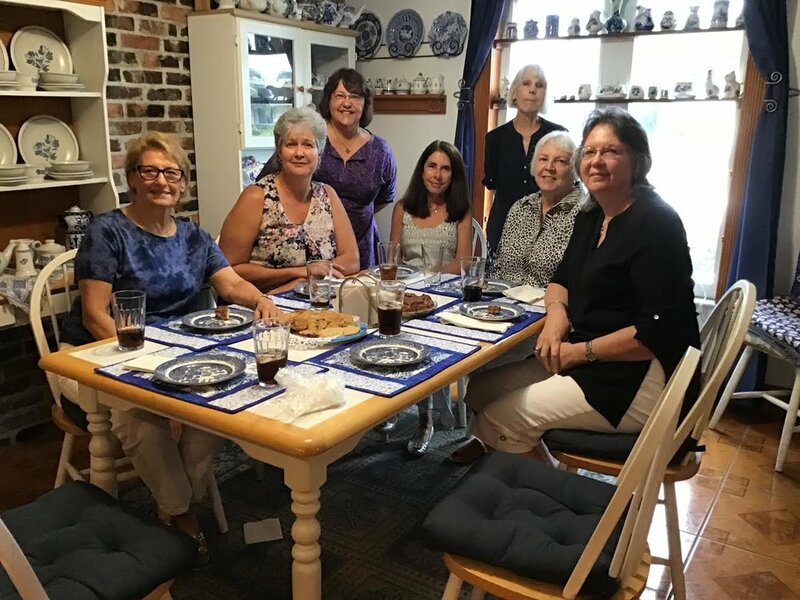 The first of these was held at Ilona's (the current guild president) house on June 10. the welcoming committee included Ilona Farnes, Amy Chiera, and Carol Stoltenberg. The new members in attendance were Katie Bonano, Thyra Schubert, Maureen Drudi, and Dale McCutcheon. After numerous requests, we will once again be ordering denim and polo shirts with the GCQG logo embroidered on them. Below are style and colors available. Orders will be taken in May, with payment, and shirts will be delivered at the June meeting. Order Form below. Naomi Jacob passed away from Cardiac Arrest On Friday, December 15th. She had recently had surgery and treatment for breast cancer. She was a long-time member of the guild, and had moved with her husband Brennan, to N.C. Her address is in the Roster. She will be missed. Carol Stoltenberg showed off her beautiful Folder Star at the July meeting, and promised the instructions for this would be posted on the website. So, click on following link to get them: Carol's Folded Star. AJ Ameno was the lucky winner of this year's donation quilt. MISSION UNITED held a special ceremony on April 20, 2017 at 3:00 PM to recognize those veterans selected to receive a quilt. The ceremony was held at the City of Sunrise Civic Center Theater located at 10601 West Oakland Park Blvd, Sunrise, FL 33351. Our guild donated 56 quilts to be awarded to the veterans. Visit this website to see pictures of the event. Here's a chance to own a piece of quilt history. Libby and her husband, Lester, have decided to offer her remaining quilts in an online auction, comprised exclusively of quilts created by Libby. The opportunity to own one of her quilts has now arrived. Go to this website for all the details, and to see the quilts, but act quickly as the auction closes April 12. Recently, we received a thank you note from Family Promise for our donation of Pillow Pals. It is a very heartwarming note. Our guild lost a valuable member last night. Bobbie Zenker passed away on November 27th from complications of pneumonia. Our beloved Gold Coast Quilters Guild lifetime member, Ruth Brill, passed away today, November 1, 2016 at 9:15 AM. Quilting has seen the passing of an era! She was a teacher, friend and inspiration to all who knew her. All of Ruth's friends are invited to a reception at the Galuppis Restaurant following her funeral on December 10th. Died November 1, 2016 Boca Raton, FL. The only child of Hanna and William Behnke. Preceded in death by husband Marvin Brill. Survived by her four children: Suzanne McCarter, Mark, Bruce and Robert Brill; grandchildren: Colleen McCarter Bloom, Kathy and Robert McCarter, Owen and Ava Brill, Laura Brill Elmore, Matthew and Charles Brill; and great grandchildren: Thor, Gabby, Ellie, Eammon, Sophie, Herschel, and William. Honorary children Kristina Harmon and Steve Thornton. Please continue to bring Military Outreach items. Next pack and ship is November 19. This time we are focusing on holiday items. Hurry and register for the 2017 Retreat. There are just a few seats left! Space availability based on postmark - mail in early, limited bus seats. On Tuesday, August 23rd, Our dear GCQG member Barbara Henschel passed away after a long illness. Family Promise of South Palm Beach County thanked our Sue Glasnap and Jane Hill, and our guild on their website for the donation of the recent Patty Project crop of quilts to their project. Its so nice to hear that they will be going to people who need them. The South Florida Modern Quilt Guild recently held a "Negative Space" challenge, and Judy Shelton's "Just Morse-ing Around" took first place in the challenge. This challenge is currently on exhibit until August 13. Please click here for more information on the exhibit. I admit that I’m an incurable punster who simply cannot resist plays on words. I also have a quirky sense of humor, and these two qualities are often reflected in my quilts. This one is no exception. Then I had great fun Googling Morse Code and learning all about it. To make it more fun, I wanted the word “Around” (in orange) literally go around. Well, the letters go around in a square, beginning on the left and then going around clockwise. I know, it sounds like a round peg in a square hole; what can I say.